Find budget prices for practical GT Zaskar cruiser bikes. 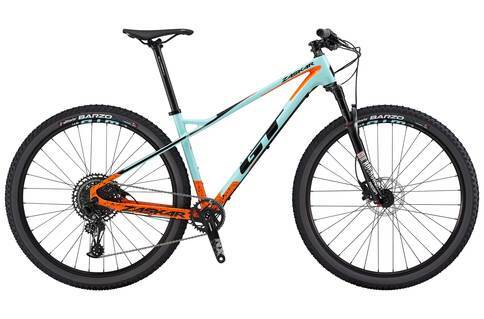 The GT Zaskar is perfect for cyclists who are looking for a mountain bike that is well-rounded and responsive. This bikes weighs around 12 kilos and has a GT Speed Metal hydroformed alloy. The fork is a RockShox 30 Gold TK, 100mm. This bike is a little more expensively priced. One of the reasons that we decided to check out the GT Zaskar was because of its connections to the original Zaskar. Of course, that was about a decade ago. However, we were suitably impressed with its predecessor to take a gander with the newer, shinier model. Let’s take a look at what we discovered. Once we hit the trails, we were pleasantly surprised by the amount of comfort afforded by this bike. This means that you do not have to worry about being bounced around or hitting the dirt too hard as you ride. As this was not something we were expecting, it did add to the experience. This bike also handles well and is easy to maneuver. We also found the balance to be particularly impressive. More than anything else, this bike is a sheer joy to riders to enjoy a bit of power. Of course, at 12 kilos it is not exactly the lightest bike around so you should be prepared to give as much as you get. While the brakes are not remarkable, they definitely get the job done. This is especially comforting as you are cycling down mountainsides, the full force and weight of the bike on you. There were one or two things to be disgruntled about this bike. First, while it will not shy away from a decent workout, it is not all that suited to harsher conditions. While it works great on a variety of terrain, it is not really built for anything too choppy. The GT Zaskar is undoubtedly a pricier option than most. One thing in its favor is that it works well as an all-rounded bike. This means that while it is not master of any one field, it is certainly a jack of many trades. The GT Zaskar is a bike that is well suited to straightforward mountain biking as well as being good on other terrain. This bike, while expensive, is worth the price tag if you are not planning on owning other bikes. In this instance, it will prove to be quite useful.